This morning ATLAS and CMS reported new Higgs results at the Hadron Collider Physics Conference in Kyoto. Only a subset of the available decay channels have been updated. The crucial diphoton channels in particular have not been updated by either experiment. This may be due to increased difficulties in doing the analysis with possible issues over systematic errors and mass/energy calibration. Obviously the systematics get more significant as the statistical errors diminish. The earlier diphoton update at 8 TeV from ATLAS already showed some signs of inconsistency with the excess peaking at around 127.5 GeV compared to lower estimates of around 125.5 GeV from CMS. We will have to be more patient which they sort it out. However, there have also been some sensational new updates. 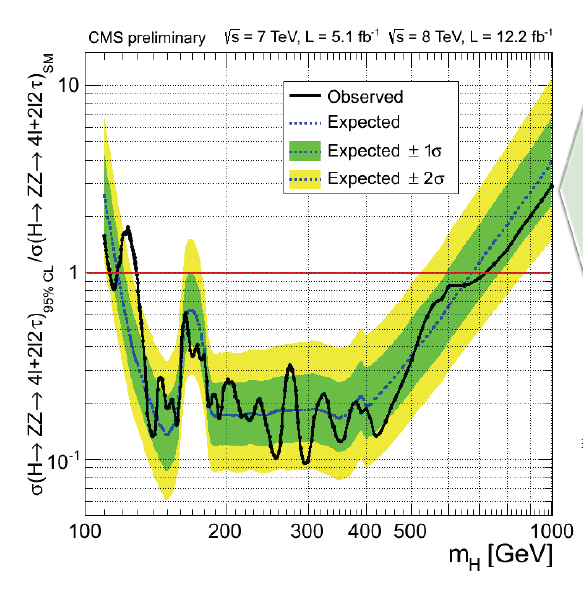 Both CMS and ATLAS have provided new results from the ditau decay mode showing an excess of 0.72 +- 0.52 times the standard model at 125 GeV in CMS and 0.7 +- 0.7 in ATLAS. A crude combination gives 0.71 +- 0.42 times that standard model. 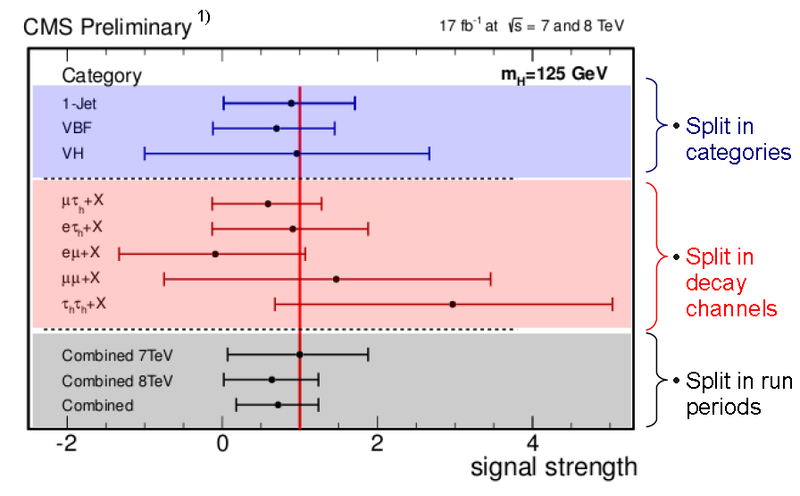 This agreement with the standard model using 17/fb in each detector overturns earlier results from CMS in July where the signal seemed a little on the low side. In the ZZ channels CMS have shown a useful update that extends the mass range up to 1 TeV with no signs of any excess anywhere other than the known 125 GeV. Although this only works directly for the standard model it is also a bit of a blow for models with a second ordinary Higgs in this mass range. You are currently browsing the viXra log blog archives for November, 2012.